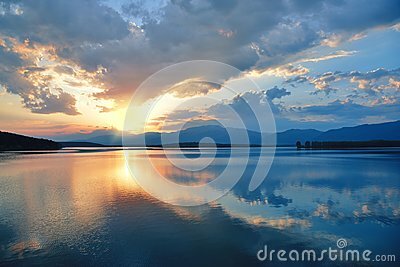 Incredibly beautiful sunset.Sun, sky,lake.Sunset or sunrise landscape, panorama of beautiful nature. Sky with amazing colorful clouds.Fantasy design.Modern Art. Magic Artistic Wallpaper.Dream, line.Background, colorful.Watercolor illustration.Blue Background for relax.